Why Kombucha? -- and a Kombucha Starter-Kit Giveaway! 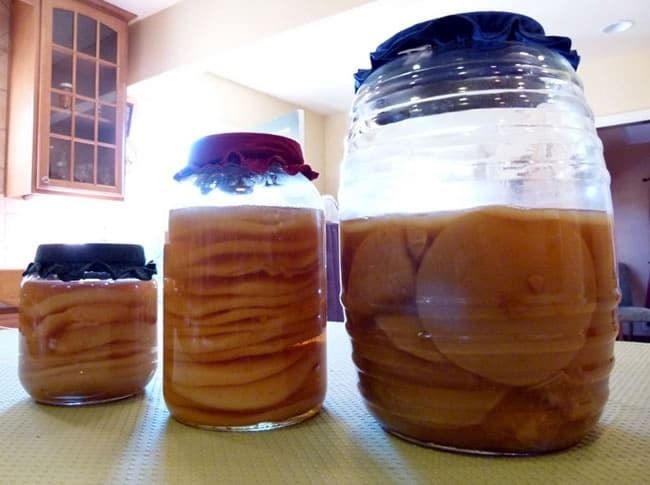 Home » October Unprocessed Posts » DIY, Ingredients, & How-To » Why Kombucha? — and a Kombucha Starter-Kit Giveaway! Why Kombucha? — and a Kombucha Starter-Kit Giveaway! With so many choices for beverages competing for your attention on the shelves these days, it can be a challenging decision. Coconut water, cold-pressed juice, and Kombucha all deliver on taste as well as benefit but which one not only packs flavor but also a probiotic punch? Kombucha, of course! What is Kombucha? Kombucha is the tangy and refreshing, fermented tea that is naturally effervescent that leaves consumers wanting more. Kombucha fans can happily cite several reasons why they would want to spend $3-$5 for a bottle of the “booch.” Here are the top 5 reasons why Kombucha is an excellent choice to satisfy any thirst. Tea is THE most popular beverage worldwide (besides water). From its mythic discovery by Shen Nong, the ancient Emperor Farmer of China in BC 5800, to the Boston Tea Party, which sparked the Revolutionary War, tea has been a vital commodity that has graced the table of every culture both near and far. These days our knowledge, appreciation, and cultivation of tea has continued to flourish as drinkers’ palates have become more sophisticated. Just as grapes imbue wine with both flavor and nutrients, so too does tea provide a pleasant and nutrient dense base for Kombucha. Now, those who’ve tried Kombucha may be thinking “it doesn’t taste like tea.” That’s because it is fermented tea (see more about Fermentation in #2). Kombucha is an acetic acid ferment, and home-brewed Kombucha has a pleasant tang and natural bubble. If you’ve never tried it, grab a bottle at your local health food store or even mainstream grocery store. Unlike most food products on the shelves these days, most Kombucha brands started in someone’s kitchen and as their passion for brewing grew, so too did their business. Like craft beer or wine, each brand has a different flavor profile so if you don’t find a flavor you like at first, try another one. Fermentation is even older than tea. Humans have been living in symbiosis with their environment and microbes since before recorded history. There are several benefits to fermentation including food preservation, bioavailable nutrients, and bacterial buddies for the digestive and immune system. Basically, fermentation is a digestive process that occurs outside of the body! Bacteria naturally present in an acidic environment break down the components of the substrate – in Kombucha’s case, tea and sugar – into smaller nutrients that make it easy for the body to absorb when you consume it. Polyphenols, antioxidants, trace minerals, and other goodies are converted into a form that the body can easily assimilate providing an instant boost. Many people find the trace B vitamins and healthy acids make them feel good. Plus without the excess sugar or chemicals of other drinks, there is less to “gunk up” the system. Fermented drinks are nature’s sodas and humans have been consuming them since before recorded history. Drinking Kombucha is akin to reconnecting with an old friend. 3. It makes people feel good! When polled, the most oft reported result from drinking Kombucha is “feeling good.” Of course, how Kombucha works for you will be a unique experience and everyone has their own Kombucha journey. Some drinkers say they experience improved digestion whereas others claim it gives them energy. Every body is different which is why we say “Trust YOUR gut.” Listen to your body and take it slow at first. We recommend drinking 4 to 8 ounces, 1 to 3 times a day. If the body is enjoying the feeling of the Kombucha, then increase gradually. Drinking water while consuming Kombucha is important to help flush the body and stay hydrated. Do you drink Kombucha now? How does it make you feel? Leave a comment below! 4. Buy it at the store! Kombucha is the yogurt of the 21st century. It used to be in the mid 20th century that you could only get yogurt if you made it at home, now it’s everywhere! Kombucha is the same as yogurt – in that while it certainly can be made at home (see #5), it’s also easy to give it a try by stopping by your favorite health food store. It’s also being sold in many Targets, Costcos, and conventional grocery stores, too. If your local store doesn’t have it on the shelf, ask them to carry it! Now, as soon as your body falls in love with how Kombucha makes you feel, you may find yourself with an expensive habit. If that’s the case, then you can also make it at home for pennies a glass. 5. Make it at home and save! Kombucha has been passed around and shared since ancient times. It might be a few hundred years old or it might be a few thousand years old! Regardless of its age, it has been able to stand the test of time because it is a hardy organism and easy and safe to brew at home. If you can brew a cup of tea, you can brew Kombucha. While it’s a simple process, it is still a process. Sourcing a quality culture will yield a lifetime supply of tasty ‘booch provided it is cared for. If you receive one from another person, make sure it is a trusted friend. Kombucha Kamp has been producing quality cultures for over ten years and ships cultures and kits all over the world. We also answer every single email that we receive at customerservice@kombuchakamp.com and with over 1 million views of our videos, it’s no wonder we are the top information site for Kombucha in the world! And Now, a Kombucha Giveaway! This kit has everything you need for brewing success (except the jar) including our 100+ page handbook and full support. Just use the “Rafflecopter” widget below to enter the giveaway. By entering, you’ll be added to our newsletter email list, and you will receive our free DIY Kombucha Recipe Guide (it will be emailed to you after the giveaway ends). Of course you’ll be able to unsubscribe anytime. Good luck! 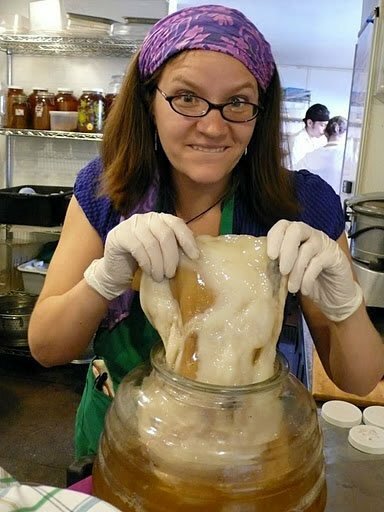 Hannah Crum is “The Kombucha Mamma” and founder of Kombucha Kamp, the most visited website in the world for Kombucha information, recipes, and advice. She is also a leader and featured speaker in the Southern California Real Food movement, using the “Kombucha Lifestyle” as an introduction to other fermented foods, gut health, the human microbiome, “bacteriosapiens,” and more. Hannah has shipped freshly grown, full-size Kombucha starter cultures to more than 10,000 people worldwide and offers Kits and Continuous Brew Packages, the ultimate in convenient homebrewed Kombucha. Get Hannah’s Free “Do-It-Yourself” Kombucha Guide with brewing, bottling & flavoring tips, and follow her on Facebook and Twitter. I have to admit that I am afraid to try Kombucha. But I think when I go to the grocery store I will pick up a bottle. I am hoping I will love it and if I do, I will want to make my own! i already make my own kombucha but would love to win some more goodies to brew with! I’ve tried to brew kombucha twice with no luck 🙁 the first time it didn’t do anything and the second time it molded. 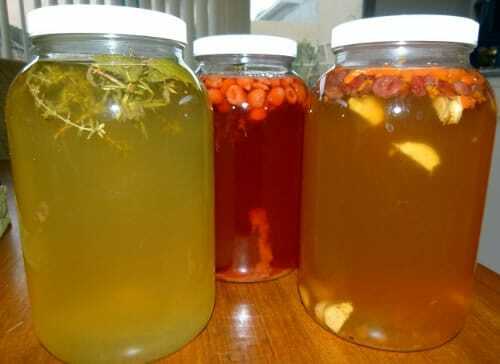 I just started making my own water kefir and I’d LOVE to start making kombucha as well. Thank you!